The strategies for losing weight are endless. A quick search for weight loss info will yield thousands of options, from fasting to fad diets to keto diet plans. Each fat loss approach can cause the numbers on the scale to plummet, but how will you prevent them from going back up in the long run? Most of us will start strong on our new diet plan when hope and motivation are running the show. A few months later, however, the struggles begin to accumulate until no amount of willpower can keep us on our diet. This pattern of short-term success followed by long-term weight regain is not unique to you or anyone who has tried to lose weight: It is what normally happens. Long-term weight loss studies continuously find that most people are not able to maintain the diet that allowed them to lose weight. This is true for every diet from keto to low-fat. If another diet, 30-day diet plan, cleanse, or any other short-term weight loss option is not the answer, then what is? We will attempt to provide you with a comprehensive answer to this question with the following five keto diet hacks for weight loss. These hacks will not only promote fast fat loss, but they will help you keep the fat off in the long run as well. One thing that makes dieting more difficult than it has to be is setting unrealistic expectations. When searching for keto diet weight loss results, you’ll see incredible transformations that fill you with hope and inspiration. What you don’t see is the struggles, strategies, and subtle changes behind the seemingly miraculous results. Almost everything you read about the diet indicates that keto causes rapid fat loss, so this must mean you are doing something wrong. Is it hidden net carbs? Should I eat more fat? Do I need to buy ketone supplements? Should I be in higher levels of ketosis? If your primary goal is to lose weight and keep it off, the answer to these questions is almost always going to be “no.” Chasing these smaller keto diet pieces before you establish a sustainable dietary approach will only lead to confusion and disappointment. This is why the first weight loss hack is to get more realistic, not strict. Compare your current self to your past self, not others. Although it can be inspiring to see incredible keto results, this can also feed unrealistic expectations and cause future disappointment. Instead of relying on inspiration and willpower to get you through the diet, focus on setting up your lifestyle, environment, and habits in a way that makes weight loss natural. We will discover how to do this in the next four keto diet hacks. Slow and steady wins the weight loss maintenance marathon. When we force our bodies into faster fat loss, our results become much harder to maintain in the long run. A healthier, sustainable, and more realistic goal to aim for is 1 to 2 pounds of weight loss per week. Track your progress regularly, but not too often. Your weight will naturally vary from day to day. To get a more accurate picture of what your weight loss rate, track your weight and waist circumference every 1 to 2 weeks. If your results aren’t trending in the right direction after a month (as indicated by a decrease in weight and waist circumference), focus on adjusting your food intake in a way that is sustainable for you. Losing weight too fast? Have slightly bigger portions or add a keto snack to your day. Losing weight too slowly? Try decreasing calorie intake by using some of the strategies found throughout this article. Does this mean you have to track calories? No, not necessarily. There are many tools that can help you lose weight and keep it off, and tracking calories is just one of them. If measuring your food and quantifying everything that enters your mouth is not sustainable for you, then focus on implementing the other four keto diet hacks. There are hundreds of ways to approach weight loss, and they all work by following one fundamental principle: sustaining a calorie deficit causes fat loss. The keto diet is one way of accomplishing this, but if it is not sustainable for you in any way (e.g., it’s too restrictive, it doesn’t improve your health, or it doesn’t help you lose weight), then eating fewer carbs or getting more strict with keto is not the solution. The best weight loss strategy is one that is healthy and sustainable for you, and adding more restriction to your diet is usually not the answer. For those of you who want to give keto a try, I recommend keeping it as simple as possible. For example, following advice like “avoid high-carb foods,” “eat mostly low-carb foods,” and/or “eat more vegetables and fewer processed foods” can lead to rapid fat loss for many. Tracking more complex keto-related variables like ketone levels and net carbs can be helpful but will not be necessary for most people. Making your diet more complicated will only decrease the likelihood that you will be able to stay on it for the long-term. Grains – wheat, corn, rice, cereal, etc. Sugar – honey, agave, maple syrup, etc. Fruit – apples, bananas, oranges, etc. Tubers – potato, yams, etc. Meats – fish, beef, lamb, poultry, eggs, etc. High-fat dairy – hard cheeses, high fat cream, butter, etc. Nuts and seeds – macadamias, walnuts, sunflower seeds, etc. Other fats – coconut oil, high-fat salad dressing, saturated fats, etc. Even with the help of simple diet rules, however, we all eventually fall back to what is convenient, painless, and pleasure-filled. This is where the next two keto hacks take over to help make your keto weight loss journey as easy and painless as possible. The first speed bump on the way to weight loss for many keto dieters is the keto flu. Simply put, when we restrict carbs below 50 grams or so, our hormone levels shift, water weight is shed rapidly, and essential electrolytes are lost. These changes can cause flu-like symptoms that turn your weight loss dreams into a keto nightmare. Fortunately, many of these symptoms can quickly be relieved by drinking more water and consuming more sodium, potassium, and magnesium. If some of the symptoms persist after making these changes, then you may need to stimulate keto-adaptation via methods other than carb restriction. Add MCTs to your diet. Studies have shown that fatty acids called medium chain triglycerides (MCTs) help increase ketone levels, reduce the time it takes to get into ketosis and decrease keto flu symptoms. Add 1-2 tablespoons of MCT oil or MCT powder to your morning coffee or tea for an extra energy and ketone boost. Start at lower doses and slowly work your way up if MCTs cause some stomach discomfort. If you’d like to learn more about MCTs, check out our guide on these ketosis-boosting fatty acids. Harness the power of caffeine. Whether you drink caffeinated coffee or tea, the caffeine in it will help stimulate ketone production and make keto dieting much easier. Try adding MCTs to your caffeinated beverage for an extra energy boost that will also help suppress your appetite. Try intermittent fasting. Not only can intermittent fasting help you lose weight and keep it off, but it can also help increase ketone production as well. Whenever we go for long periods without food, our bodies naturally increase ketone levels to meet some of our energy needs. This means that, by skipping a meal or two, we can help push our bodies into ketosis more quickly. Increase your physical activity levels. All types of exercise can help increase ketone production in different ways while you are on the keto diet. Low-intensity exercises like walking and yoga can help increase fat burning and provide your liver with more ketone building blocks. In contrast, moderate- to high-intensity exercise like running, high-intensity interval training, and weight lifting help deplete glycogen more quickly and increase your body’s need to produce ketones. In other words, no matter what form of physical activity you add to your life, it will help you adapt to the keto diet more quickly. Ideally, to make your transition to keto and ketosis as smooth as possible, try combining intermittent fasting, caffeine, MCTs, and exercise in a way that is sustainable for you. Each one will help you in your efforts to lose weight and keep it off as well. Willpower, motivation, and a restrictive diet may help you transform your body, but they will not help you maintain your results. Your lifestyle and food environment will win out in the long run. To make weight loss easier to achieve and sustain, we must focus on changing our lifestyle and environment in a way that feeds our results. This will help relieve some of the internal struggles that most of us experience when following a new diet while increasing the likelihood that we will make healthier choices when we are stressed, tired, or lack the discipline. Follow simple diet rules. The best diet for you is going to be one with rules that you can easily follow with your current habits and lifestyle. The keto diet, for example, requires you to restrict carbs to a level that helps you sustain nutritional ketosis. This is a simple diet rule that is easier to follow for some and nearly impossible for others. If the keto diet’s “rules” are not sustainable in any way for you, then you may need to follow a different set of rules that help you lose weight. Perhaps, eating fewer carbs or eliminating most processed foods from your diet may be a more sustainable rule for you to follow if keto is not feasible. Skip a meal or two (intermittent fasting). By eating all your calories in a smaller time window (i.e., 8 hours instead of 12 hours), you will naturally eat less food and lose weight without feeling like you are being restricted. You can implement this strategy by simply skipping breakfast each day or sticking to specific fasting and eating time windows. For more on intermittent fasting, click here. Track protein, fat, carb, and calorie consumption. Tracking what you eat can help you understand how much you are actually eating and how that translates to weight loss or weight gain. After a few months of using this method, you will develop a sixth sense for calorie intake that will help you make healthier decisions without having to measure everything you eat. For more on how to track calories on keto, click here. Use caffeine and/or MCTs to suppress appetite and keep energy levels up. Both caffeine and MCTs have been found to increase ketone levels and suppress appetite. Many people will combine coffee, MCTs, and intermittent fasting to help them lose weight and keep the weight off without having to worry about how much they are eating. Change your food environment. Your surroundings are constantly nudging to make certain choices. Just seeing a tasty, unhealthy food for a second can trigger cravings that are almost impossible to resist when we are stressed, tired, or hungry. This is partly why taking control of your food environment is one of the best ways to keep yourself from overeating and gaining weight. We will take a closer look at how you can do this in the next section. Exercise regularly. An interesting finding from the long-term weight loss research is that the people who regain the least weight are usually the ones who exercise regularly. This doesn’t mean that exercising is what causes long-term weight loss, but it can help indirectly in many different ways. Ideally, try lifting weights 2-3 times a week and increasing your activity level throughout the week by going for walks, hiking, cycling, playing sports or doing any other physical activity that you enjoy. This is the simplest way to get the most out of your exercise regimen. Each one of these strategies can help make weight loss much easier to achieve and sustain. You do not have to implement all of these to be successful. Focus instead on finding two or three strategies that you can easily add to your life for the foreseeable future. This may take some trial and error, so give one or two of these strategies a try. If any option is not sustainable for you in any way, then try another suggestion from this list. Eating is one of the most emotionally charged things we do. If we didn’t capitalize on the opportunity to have more calories in our paleolithic past, we would no longer exist. This potent emotional response to convenient calories is ready to be triggered at any moment by what we see, smell, think, and feel. These triggers will then create an internal conflict that makes dieting so difficult. One part of you (your emotional brain) will want to satisfy a specific craving, while another part (your rational mind) knows that it is not allowed on your diet. When we first start any diet, we have plenty of motivation and willpower to say “no” to that craving, so our rational brain usually wins the battle. However, we will not always be in a motivated, strong-willed, or disciplined state of mind. In these moments, cravings will be insurmountable, and we will eventually give in. This is one of the fundamental mechanisms behind weight regain. We stick to the diet for a few months, but those potent food triggers and desires win out in the long run. Our rational mind may win some battles at first, but our emotional mind will usually win the war. One of the best ways to address this common issue is to change your food environment so that it influences you to make better choices instead of unhealthy ones. This weight loss hack will remove the triggers that cause many of the internal conflicts between your emotional mind and rational mind. In some cases, your emotional and rational mind will even work together, putting your weight loss results on autopilot (no willpower, restriction, or discipline needed). Let’s take a look at what you can do at home, while traveling, and in restaurants to make weight loss easier to achieve and sustain. Remove anything unhealthy or high in carbs from your home. If you need to keep some of these items for others, then move them to a place that is hard for you to see and/or access. By doing so, you will prevent a common craving trigger. Store healthy keto-friendly options in easy-to-see, convenient places. By making healthier choices more accessible, you will increase the chances that you’ll stay on the diet. Use smaller plates. In one experiment, conducted by Brian Wansink from Cornell University and Koert van Ittersum from the Georgia Institute of Technology, it was discovered that a shift from 12–inch plates to 10–inch plates resulted in a 22% decrease in calories. Similar findings have been reported in other studies as well. Researchers believe that this effect is the result of a simple optical illusion. When you use smaller plates, your portion sizes will look much bigger, making you feel like you are eating more food. As a result, you feel satiated sooner and eat less food. Have a plan to satisfy your sweet tooth. Sometimes cravings are unavoidable, and the only option is to have something sweet. This is when it is helpful to have a keto-friendly option available to give you the flavors you crave. Check out our keto dessert recipes for some delicious ideas. Keep in mind, however, you can still gain weight from eating too much keto-friendly food. If you tend to binge on sweets when they are available, only make one serving of a keto dessert each time. Bring keto snacks with you when possible. Having tasty keto snacks on hand will keep your cravings at bay and prevent overeating. Check out our keto snack list to help you prepare for your next trip. Plan ahead. Make sure you are prepared for the worst while traveling. Check for keto-friendly options at local restaurants, prepare keto snacks beforehand, and fall back on simple snacks like nuts, cheese, and meat sticks/jerky (with no added carbs or sugar). To help you conquer keto while you travel, feel free to use our keto travel guide as well. Enjoy local food in moderation. You don’t have to stay on keto to lose weight and prevent weight gain while traveling. Feel free to enjoy as many high-carb culinary experiences as you like. Just make sure you keep your indulgences in moderation or reduce your food intake in other ways to prevent fat gain (use hack #4 for some ideas). Plan ahead. Check out the menu ahead of time to make sure you are going to a place that has keto-friendly options. To help you plan ahead, check out our guide to eating keto on the go. Have half your meal wrapped up to go. Calories from the appetizers and your main entree usually add up to a substantially bigger portion than you’d eat at home. To prevent eating out from causing you overeat, ask the wait staff to wrap up half of your entree portion to go. Eat a keto meal before you go. Fill yourself up with healthy and satiating food before you show up. This will help control cravings and prevent overeating. Have a plan to satisfy your sweet tooth. Keto-friendly desserts are hard to come by. Instead of making an excuse to eat something that is sugary and unhealthy, think about a keto-friendly version you can have. Make the keto dessert when you get home, have a ready-made keto sweet at home, or find a keto-friendly sweet at a nearby grocery store (stevia-sweetened, sugar-free chocolate is a great option). That piece of sugary cake is never worth it. Indulge in moderation. If you absolutely must have something that is high in carbs and far from keto-friendly, then enjoy it without the guilt. It may kick you out of ketosis or put you over your daily carb limit, but this doesn’t mean you will gain weight. As long as you take the necessary steps to maintain a calorie deficit for weight loss, you can fit the occasional indulgence into your diet (use hack #4 for some ideas on how to do this). By making adjustments like these, you can harness the power of your environment in a way that transforms weight loss from an inconvenient chore into a naturally-occurring process. The odds of staying on any diet are roughly the same for all diets. Weight loss is caused by the same underlying principle for each diet: a calorie deficit causes weight loss. This means that your primary focus should not be on finding the best diet if you want to achieve your goals and maintain your results. Instead, we should be diverting most of our attention to formulating a weight loss approach that is sustainable for each individual. Set realistic weight loss goals. 1 to 2 pounds of weight loss per week is a healthy rate to aim for. Increase food intake to slow weight loss and reduce food intake to increase the pace. Keep keto simple. Start by eliminating high-carb foods and eating mostly low-carb vegetables, meat, fish, eggs, and cheese. This may be all you need to focus on to achieve amazing weight loss results. Make keto-adaptation easier for your body. Rehydrate, replenish your electrolytes, and promote ketone production with MCTs, caffeine, intermittent fasting, and/or exercise. This can help prevent the keto flu from getting you down and make your keto transition much more manageable. Implement sustainable strategies that help you achieve and maintain weight loss. Anything that helps you naturally eat less and promote weight loss is a great option. More restriction usually makes the diet less sustainable in the long run, so look for strategies that you can easily fit into your lifestyle. Create an environment that feeds results. Make healthy choices as convenient as possible, and unhealthy choices as painfully inconvenient as possible. Always have a plan so that you can maintain your results in any food environment. By implementing these five keto diet hacks, you will be able to lose weight gracefully. Once you hit your weight loss goals, you will already have many key habits and lifestyle factors in place to help you sustain the results for the rest of your life. Say goodbye to yo-yo dieting and relying on willpower to get you through. It’s time to formulate a diet that is both effective and sustainable for you. For more information on how to do this with the keto diet, I recommend checking out this article first. P.S. 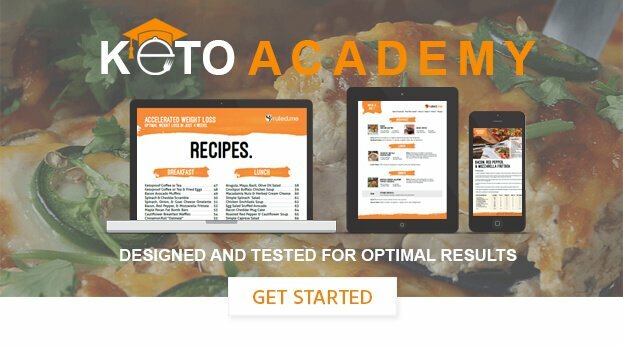 Have a look at the Keto Academy, our foolproof 30-day keto meal plan. It has all the tools, information, and recipes needed for you to succeed. + The food has been tested and optimized so you can lose weight and start feeling great! Large restaurant portions a global problem, study finds — EurekAlert!